Well, the boy has finally decided to spend money. HIS money. Not MY money. I'm happy because it means...well, I'm honestly not sure what it means. The phrases "growing up" and "financial responsibility" come to mind, but so do "wasteful use of life savings" and "great, more plastic crap for me to step on in bare feet in the middle of the night when I'm walking to the bathroom to go pee." The point is, we spent some time together yesterday counting his tooth fairy money, the 50 cent pieces that Max and brought back from Las Vegas a few years ago (BLACKJACK!) and various other coins and dollar bills that somehow ended up in his possession. And it was adorable. 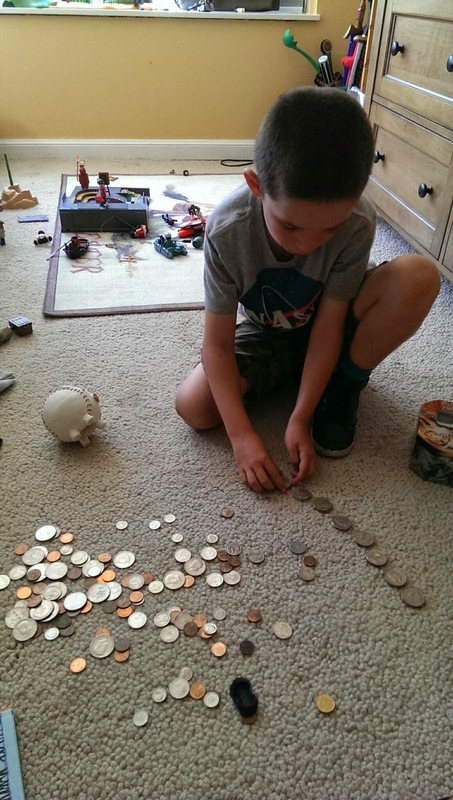 His baseball-shaped piggy bank was practically vomiting carefully folded dollars and pocket change on to his bedroom floor. Not to mention how his first grade counting skills really paid off--they had learned about counting by 5's and 10's using coins this year. We counted out $58.97, and today, after a trip to Toys R Us, the kiddo is $26.98 poorer and a Playmobile cowboy set richer. Capitalism is alive and well among the six year old set.